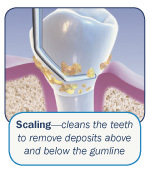 Scaling - The Removal of calculus (tartar): Calculus is hardened plaque that has been left on the tooth for some time and is now firmly attached to the tooth surface. 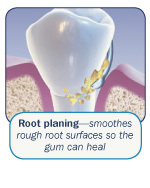 Calculus forms above and below the gum line and can only be removed with special dental instruments. Adjunctive Therapies - Local delivery antimicrobials (i.e. Arestin®) and host modulation, as needed on a case-by-case basis. REMEMBER! The key to help protect against periodontal disease is by preventing bacterial plaque buildup. It is important to have regular professional cleanings in addition to brushing and flossing every day. Many patients do not require any further active treatment, including surgical therapy. However, the majority of patients will require ongoing maintenance therapy to sustain health. Non-surgical therapy does have its limitations, however, and when it does not achieve periodontal health, Dr. Chang may recommend surgery to restore periodontal anatomy damaged by periodontal diseases and to facilitate oral hygiene practices.